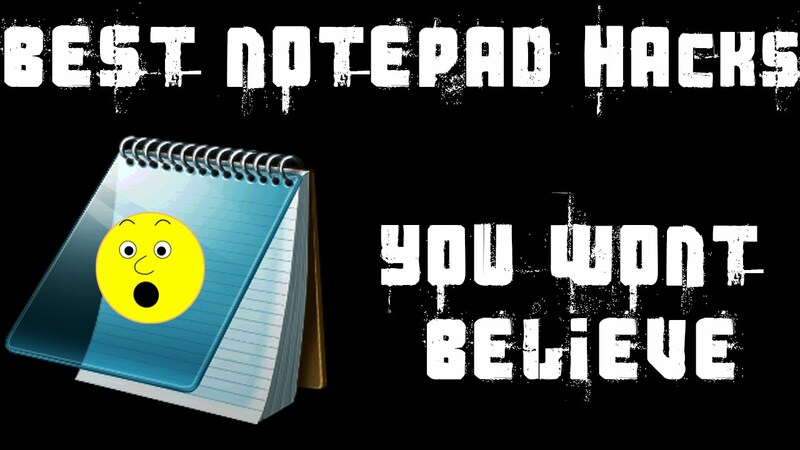 We are back with the best notepad tricks. You might wonder that how this is possible? Well, this is true and you can able to use notepad and do trick with your friends. There is a programming language which uses to make notepad tricks. However, if you don’t know the programming language then don’t worry I am here to give you all codes, so that you can use these tricks with your friends. There are many users who wants to learn these languages. I will suggest you to join an institute near your area and tell them that you want to learn programming they will help you to learn all those stuff. After that you too will become smart programmner and make cool notepad tricks. It is a software which is present on every OS (Operating System) of the computer. However, there may name changes of that software. Well, don’t worry If you are using windows then it will help you very easily. Notepad is like you can just program your computer with it and that computer will do work as said in programs. You can do a lot of fun with these Notepad tricks. If you want to learn programming of Notepad then I will suggest you learn Batch Programming. It is using in Notepad tricks, well you can use a lot of other languages but these tricks are especially for funny and cool notepad tricks. And you can make HTML files and use all other programming languages. But you should change the extension of Notepad. Extension starts from (.bat .html .tag .vbs etc) there are lot of extension. You can also make your friend jealous of you with the help of these notepad tricks. #1. Make Fake Windows error with the Notepad Tricks. With the help of this trick, you can make your friends problem and feel them worry about their PC. So, you can use this type of trick. You can replace put your message here and put a funny sentence. It will be visible when this error occurred. Just open your notepad and paste these codes. First thing first, So you have to open notepad and it is because it is very important step ???? Type .LOG on your Notepad. So, whenever you will write something on this notepad it will add time and date. Save it as anything.bat and send it your friend. When He will open that program then He will be in small trouble. Don’t think that these lights will dance and entertain you. But it will flicker like on and off lights. Your all lights Num lock, scroll lock, caps lock. Paste this secret code in your notepad. So, whenever you will open it then your all lights will dance like it will blinks. This is an amazing Notepad trick to check your antivirus program. You have to follow some basic steps. Open Notepad and paste below codes. So, if your antivirus is working perfectly then your antivirus will tell you to delete this file. If nothing happens then just change your antivirus Now. This trick is most popular notepad tricks and cool notepad tricks. Just open Notepad and paste the following codes. And save this file as techmaniya.vbs and that’s it. With the help of this trick your windows will shut down forcedly. Paste @echo off in next line. Paste *shutdown computer in next line. Then just open that notepad and then your PC will automatically shut down. If you don’t want to use folder lock then you can use this self-made locker for your folders. This is really amazing and interesting notepad tricks. com wrote in red color in your password. So, no one will able to see your folders without your permission. Just Open your Notepad and enter this code. Then save as to .vbs format. After opening it, backspace will automatically start pressing. With the help of this trick you can delete all files of System32, then windows will be corrupted. Save it as .bat then open it. After that your system files will be deleted. Note: Don’t use this code, unless you don’t know about windows corrupt. Are Notepad Tricks useful to you? These notepad tricks are simply amazing. Some of the notepad tricks are the best and they will help you also. If you find it useful then you can share it with your friends and tell them to use these Notepad tricks which will help you to do fun with your friends. So, here was our all cool notepad tricks with these notepad tricks you will able to play pranks with your friends. If you found any one of above code is not working then comment below I will definitely solve it. If you want more tricks then you can subscribe to our mailing lists or you can like our facebook page to get updated.